Summer has hit and we’re really trying to find ways to save on summer childcare this summer. Our schedules have never been more flexible. Hubs’ personal training schedule has him doing a split-shift. He works early in the morning and in late afternoon/early evening (the before and after work crowds), so he has most of the middle of the day “off” right now. And as it’s summer, I still have work to get done but I’m not teaching any classes and I can completely make my own schedule. There are far fewer meetings and obligations on campus so I’ve been working predominantly from home. It’s worked out well. I’m with the kids in the morning and evening, and hubs takes the mid-day shift while I sequester myself to my bedroom or go to a coffee shop to work for a few hours. Boom! No outside childcare required (note: we are going to do a couple of weeks with childcare 3/week when its needed, but so far we haven’t needed it since we’ve been able to trade-off childcare). The only “problem” with this situation is that the kids complain that they are bored CONSTANTLY! We’ve been going to the neighborhood pool literally every single day, but we don’t last long as it’s been 110 degrees of sweltering Arizona death-heat. I’ve printed up free first grade worksheets so they’ve been doing educational activities. We have a closet full of games and craft supplies. But it’s still tough to find fun things to add to the mix that don’t include anything outdoors (again – see death-heat comment above) and don’t cost an arm and a leg. Our public library system has a great summer time program! We went a couple weeks ago and found out they’re doing a whole summer reading program. They had a Scholastic book fair thing set up and every kid got to pick out 1 free book! Plus they received reading logs so they can track their reading and bring it back in to receive stickers as rewards for reading. In addition, the libraries have a variety of activities and special events lined up throughout the summer. We got a schedule and I put things on my calendar. 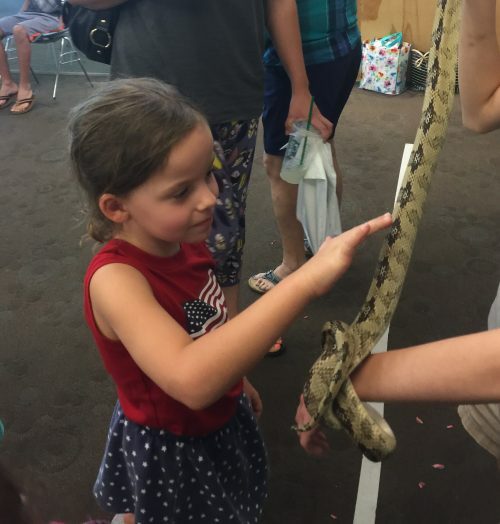 Last week was our first special event of the summer season: it was ZOO day at the library! The staff brought in many (maybe 8-10??) 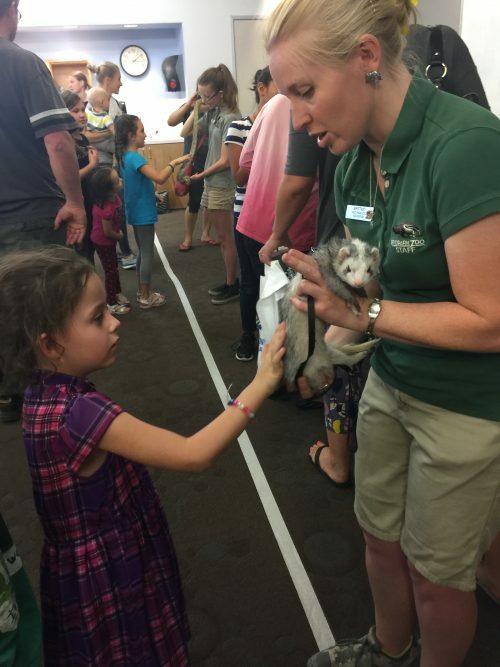 different animals for the kids to see and learn about. And at the end, they had a “petting zoo” with two of the animals: a ferret and a snake! The kids loved it, and it was a fun and educational activity that occurred completely indoors during the worst heat of the day. A great way to spend an afternoon! And a fun free activity in general! Do you participate in the summer library programs in your area? What other free kid/family events do you recommend for summer (preferably indoors, due to excessive heat)? When our kids were young, we made a “fun jar” for the summer. The kids thought of free or low cost activities, wrote them on paper and put in the jar. When we had free time, they would take turns picking out an activity from the jar! Activities included: library (our library had free kids movies in the summer too), walk in the park, bike ride, play in sprinkler, bake cookies, put on play, lemonade stand, movie at the air conditioned theatre, make a fort in basement, bead/jewlery kit, scavenger hunt, make slime, play doh (for hours! ), bowling, trip to the spray park, make ice cream or popsicles, write notes to family out of town, learn a new card game, spa day (nail polish and curl hair), camp in the back yard, farmers market, putt putt golf…. We also had chores to do every day – that took up time and energy and taught them how to help around the house. I LOVE these!!! Great ideas, thank you for sharing! I absolutely agree!!! Some of my favorite memories from my childhood were during times of unstructured “free play” in the yard and/or with neighborhood kids! If I told my parents I was bored they would give me a chore to do. Nice job eliminating that childcare cost! Hopefully that helps the budget deficit. It will certainly help! Childcare is still our second largest monthly expense (behind only the mortgage). It will be a huge help to not have to pay for full-time childcare all summer long! kids receive 2 games free to bowl every day once you sign them up. It’s free. We do this. This is the last year Princess is eligible but my kids LOVE it! And you can pay right at $30 and then you and/or your husband can bowl with them. Great job finding the library activities, and other great ideas! Do you ever organize play dates for your girls? It’s fun for them to be with other kids, and ideally, you’d share the time with other parents. I approached DS3’s best friend’s mom with this idea when my DS3 and her DD were 5, because she was about to give birth to her DS. For years, she picked them up after school twice a week, and me or my carer would pick them up twice a week. We also organized play dates during vacation. Sometimes I kept them, sometimes she did, sometimes we all did something fun together. As they grew older we’d take the other one on vacation because our kids were always so much happier when they were together. Today my DS3 and her DD are now 20 and they are STILL best friends!